Burn Bright affected me exactly how I expected; it blew me away! Marianne de Pierres' talented and creative mind created a world unlike any other I've seen. Her writing style is descriptive and flows easily. The novel's consistent tone is dark and delicious, spreading chills throughout its mysterious plot. In part one, Retra, the Grave South Seal, escapes to the island of Ixion. Ixion is supposed to be a place where oppressed kids can go to let loose and embrace pleasure. I love the irony, which Retra picks up on pretty quickly, of Ixion having just as many rules as Grave, though they are less strict. Part two of the novel sees a profound change in Retra's personality and character. The process is quick, but the novel still gives readers enough time to get to know Retra's new persona. Secrets of Ixion have been discovered and she's right in the middle of an impending war between the Guardians of the island and its rebellious members. Burn Bright is part dytopian, part mystery, and part science fiction and fantasy. I love that there are so many of my favorite elements in the novel, but the plot is still connected and entertaining. It's strange that Retra believes Grave is the only place in the world until she meets people from other provinces while on Ixion. She's completely ignorant about her world, which is filled with other cultures and philosophies. Even people outside of Grave South are different from Seals, but she hadn't known until she met other batlings: Markes, Suki, and Rollo. The characters of Burn Bright are all fascinating with wild personalities; the scenes livened with their quirky chatting. The friends Retra makes, especially Suki, helped her loosen up and guided her through unfamiliar territory. The whole novel has this sinister vibe, readers know something bad is bound to happen, but the characters are a fun distraction from that darkness. Burn Bright is amazing! Whoever is able to read this novel and doesn't is completely fou! 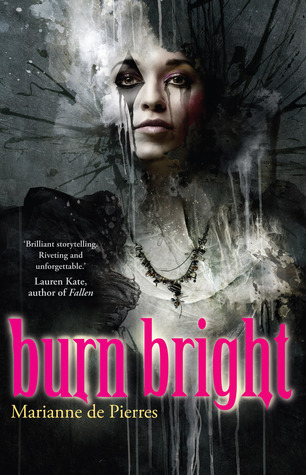 Add BURN BRIGHT to Goodreads.